Stanford professor Sachin Katti heads up a company that has developed technology to allow wireless systems to handle twice the bandwidth by doing away with the “self-interference” problem. Current wireless communications systems can’t send and receive data at the same time because the transmissions interfere with the signals being received. Radio transmitters like cell phone towers, wifi routers, wifi-equipped PCs, cell phones and other wireless broadcasters must either use separate transmit and receive frequencies or rapidly alternate between transmit and receive modes to get around the self-interference problem. To eliminate this bandwidth waste Kumu Networks, a startup headed by Katti, developed a technique to assess the interference likely to be produced by the transmission and simultaneously generate an off-phase signal to cancel it out. A new cancellation signal is generated for each transmitted data packet, allowing the system to work even for mobile devices whose transmissions cause interference inever-changing configurations due to signals reflecting off constantly changing surroundings. “This was considered impossible to do for the past 100 years,” notes Katti. Self-cancellation techniques have been used in the past but not for the kinds of transmissions involved in LTE and wifi for which the signals to be cancelled are five orders of magnitude greater than the signals being received. Kumu’s technology is one of several that have been developed recently to improve bandwidth efficiency for wireless communications. Others include new ways of encoding data, ultra-rapid shifting of frequencies and software solutions for making more efficient use of the radio spectrum. But Kumu’s technology has impressed enough knowledgeable people to attract $10 million in venture funding from the likes of Khosla Ventures. It has also persuaded a major wireless carrier to conduct trials of the technology early next year. 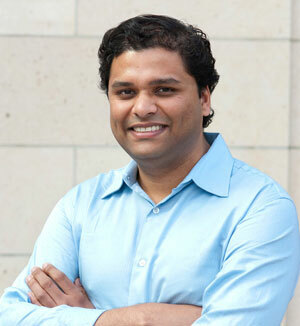 Sachin Katti is an assistant professor of electrical engineering and computer science at Stanford. He is one of several among his colleagues and graduate researchers at Stanford who joined to co-found Kumu. He received his PhD in EECS from MIT in 2009. His research focuses on designing and building next generation high capacity wireless networks using techniques from information and coding theory. Sachin Katti is co-founder and CEO of Kumu Systems, a startup that offers wireless networks the ability to double their bandwidth.